Bear with me, this is a long post with lots of images, but I thought I would create a step by step ‘How To Create a Shabby Chic Table Top’. This is a great space saving, as well as money saving idea, as most of the items I had lying around the house, just need to buy the timber sheet, and not being an entire table it does not take up that much room. Mix and Match colours for different effects. I attempted to create a video, but alas, it was not meant to be. 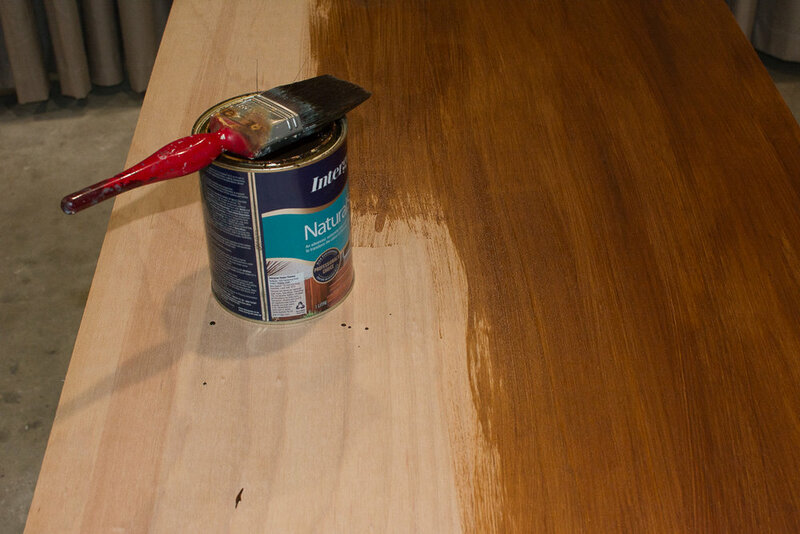 Wipe down board to remove dust and particles, then give one coat of timber stain with soft brush. Leave to dry minimum 2-3 hours. Wash and dry brush. Give 2-3 coats of white paint, leaving 2-3 hours between coats. Try wrapping brush in Glad Wrap (Cling wrap) between coats and leaving in the fridge, that way you don’t have to keep washing it. Once completely dry, leave overnight and then sand back the white paint revelling the stain below, sand in some areas more, like normal wear and tear along edges etc. I have a Black & Decker Mouse, electric sander which I have had for years, making a very quick job of this, but it can be done by hand as well. Then taking the umber acrylic paint, mix with the paint retarder and lightly brush over the table top, then rub in with paper towel, and then rub off excess with wet (with water) paper towel, work in sections and move thoroughly over the entire piece, until you are happy with the result. Again, leave to dry (overnight if possible) and then sand again until you are happy with the rustic result. Another option is to rub beeswax mixed with a patina like umber to give an aged effect. This is a behind the scenes if you will plus a few different shots using my new shabby chic table top. Not exactly the perfect finish, but I am quite happy with the result, you can further age the top via scratching and denting it up a bit, but I figure that will probably happen gradually as it gets used as well.